Cover illustration. Sometimes it's better to admire a species in habitat or even in a photo rather than try to grow it. 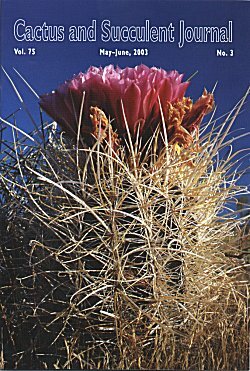 If that sounds defeatist, you probably have not attempted to keep Sclerocactus polyancistrus for long. Though it is one of the most beautiful of cacti, it is also one of the most difficult to grow, as it easily rots-unless you live in the hot arid areas of Nevada and California where it is native. In the 1950s, at the UC Botanical Garden in Berkeley, we had a stunning specimen collected in Nevada and much admired by visitors to the glasshouse collection. After several months it expired, but the stem was so hidden by the spines that it was left in its pot for quite a few months longer. Its beauty was undiminished, and probably few ever noticed it was no longer a living plant. Although normally clothed in a mixture of red and white spines, the specimen on the cover is entirely white-spined. Rob Skillin of Bakersfield, California, took the photo in the El Paso Mountains of California. His photo of the varicolored form-growing at the same locality-was featured on the cover of Haseltonia 7.